During his lifetime, the path breaking and prolific lensman, Raja Deen Dayal (1844-1905) was one of the most widely recognized photographers from the Indian subcontinent. Today he remains among the most celebrated figures from this earlier era. This book brings together for the first time extensive archival research with close analyses of the significant body of work preserved in the Alkazi Collectio of Photography. Over the course of his remarkable career, Dayal opened studios in Indore, Secunderabad, and Bombay, employing over fifty staff photographers and assistants. Together, they produced more than 30,000 images of architecture, landscape, and people that have played a central role in how India’s past has been visualized. This volume explores varied topics, from Dayal’s public works, state visits and hunting photographs to his images chronicling India’s elite and growing middle classes. In this way, it lays the groundwork to rethink the history and practice of photography in India: as a commercial business, as an engagement with new technology, and as an aesthetic enterprise. It also demonstrates photography’s unique trajectory in India as well as its inseparability from a larger world history of photography. Raja Deen Dayal was born in Sardhana, near Meerut. He trained at Thomason Civil Engineering College in Roorkee in the mid 1860s and rose quickly through the ranks as a Surveyor with the Public Works Department of the Central India Agency in Indore. He began photographing in the mid 1870s, becoming a master in the delicate art of developing glass plate negatives and albumen prints and producing what are still some of the most stunning views of the architecture and landscape of northern India. Ever the consummate businessman, Dayal soon counted the elite of British and Indian society amongst his clients. Eventually, in 1894, he was appointed court photographer to the sixth Nizam of Hyderabad and the studio, Raja Deen Dayal and Sons became the first Indian firm to receive the Royal Warrant from Queen Victoria. 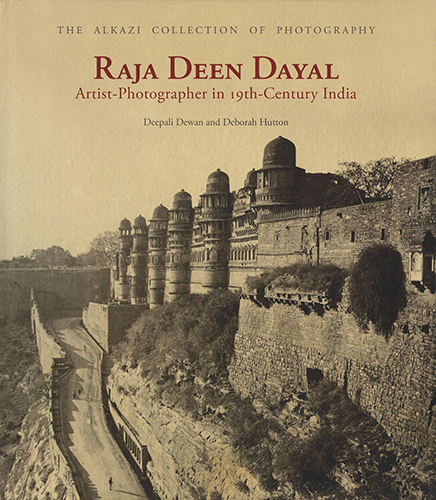 Dayal’s career testifies to photography’s paramount role in the overlapping arenas of the Princely states, British Raj, and the emerging cosmopolitan centres of nineteenth-century India. Deepali Dewan is a Senior Curator in the Department of World Culture at the Royal Ontario Museum, Toronto, Canada. Her research encompasses colonial art education, the history and theory of photography in India, and the visual dimensions of modernity as examined through a transnational lens. She is the author of Embellished Reality: Indian Painted Photographs and editor of Bollywood Cinema Showcards: Indian Film Art from the 1950s to the 1980s. Deborah Hutton is an Associate Professor in the Department of Art and Art History at The College of New Jersey. Her research is focused on examining the relationships between art, identity formation, and intercultural exchange at the princely courts that ruled over the Deccan region of India between the 16th and early 20th centuries. She is the author of The Art of the Court of Bijapur and co-editor of Asian Art and A Companion to Asian Art and Architecture.